The Safety Elf aims to demystify health, safety and wellbeing by giving top quality advice, information and support to businesses to ensure they are legally compliant. They were looking for a different way of communicating their expertise in ergonomics. They approached Ilona Design with an idea of giving away a free handy guide to a more comfortable desk space, something many people face problems with every day. The aim was to make it easy to digest and fun to look at. 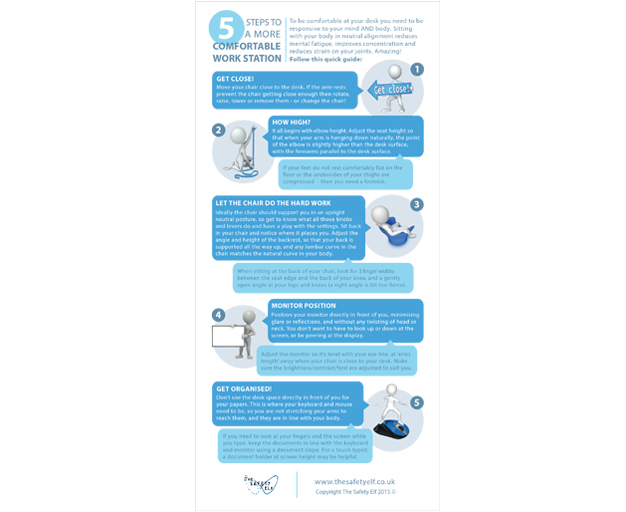 We used their brand icons and colours to transform the ergonomics tips from a bullet-pointed list into this fun infographic leaflet. Perfect! Thank you – it has been a real pleasure working with you on this. I love your vision and I LOVE the design!